This book is not yet published – pre-order your copy now. A hands-on guide for the reduction or elimination of fluoroscopy during the mapping and catheter ablation of cardiac arrhythmias using intracardiac echocardiography (ICE) and electroanatomic mapping (EAM). A host of expert and experienced authors present a practical overview of the rationale and methodology for a low- or zero-fluoro environment in the electrophysiology lab with the critical goal of significantly reducing radiation exposure to the patient, physician, and staff. 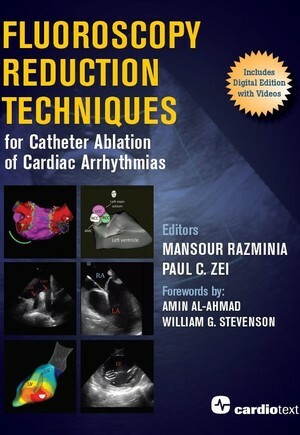 • Covers the entire spectrum of commonly (and less commonly) performed ablation procedures. • Includes a library of 38 videos, including 9 extended films (108 minutes) by Dr. Razminia detailing step-by-step procedures and techniques. • Discusses general principles that are applicable across ICE and EAM platforms. • Will assist the electrophysiologist and their team to safely and effectively work toward the significant reduction in fluoroscopy utilization while also likely improving procedural safety, i.e., fewer complications, after the adoption of these techniques.